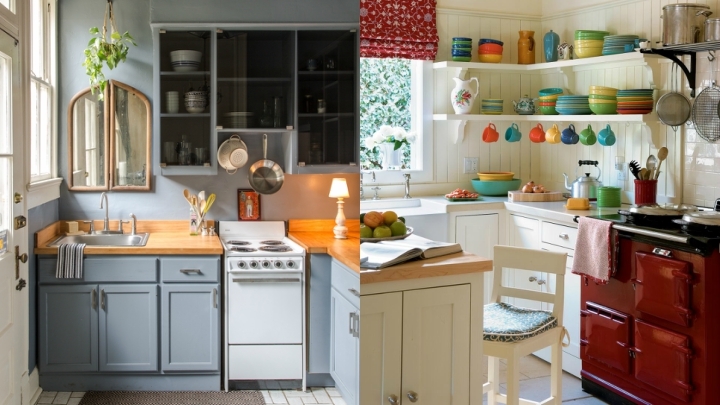 Decorating a small kitchen can become a challenge for our creativity. It is important to know how to take advantage of the available space in the best possible way and for this we bring you a series of ideas with which you can get the most out of every square meter of your reduced stay. Not because we are small we are going to limit its storage capacity or its decorative potential. The other way round: we’ll give it more life and it will be more functional than if it had a lot of space for everything. We begin with a basic rule of decoration of small spaces: the use of light tones will visually expand the space. The white will be a very good choice, although you can use other soft hues you like. This is useful for both walls and furniture. And if you want to introduce some stronger color you can do it in some small decorative object, as a detail. If you combine these light tones with wood also clear you will design a cozy atmosphere. What is involved is to take good advantage of every available space, every corner, and there are elements that will help you achieve it. 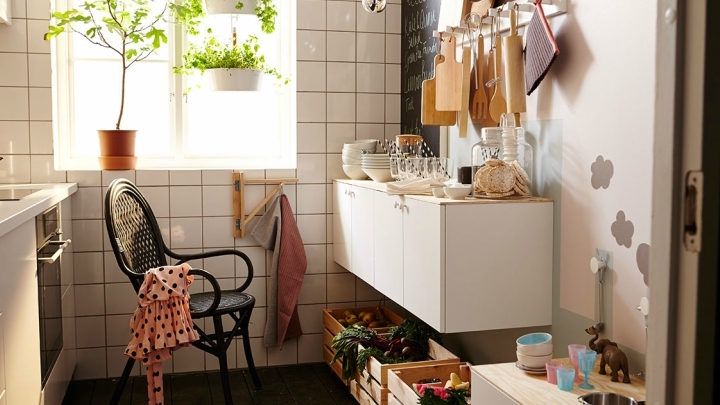 Look at this example of an Ikea kitchen, how they have managed to take advantage of space through a wall-hung cabinet that also serves as a shelf, with baskets under the cabinet and hooks to hang smaller utensils. Everything is in sight, decorates the room and is very functional. Hooks and bars in general are very useful in small kitchens, since you can place them in many places, even inside the closet doors, and allow you to keep your space tidy. 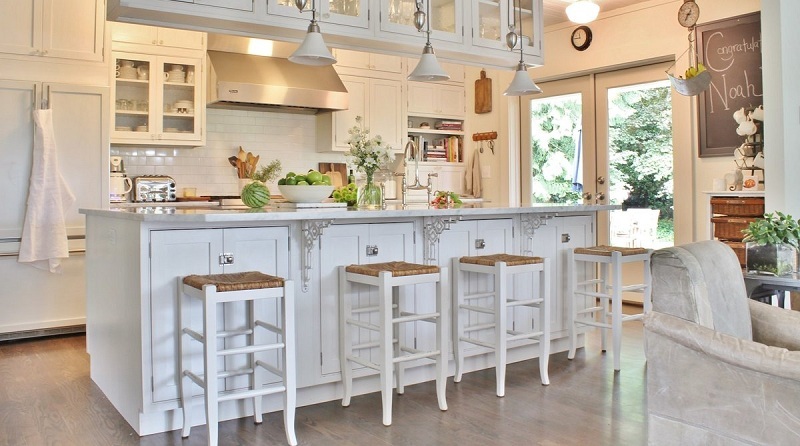 Generally a small kitchen has no place to leave a table and chairs mounted. But perhaps you can leave it folded against the wall, and open it when you need to use it. You can store some stools in the storage room or in some space that you have available for it and when you go to eat take them to the kitchen. Meanwhile, the space will remain empty and without interruption in the passage. Sometimes we try to fill the closets of things or put many of them but we are forgetting the hole that can be used: the side. 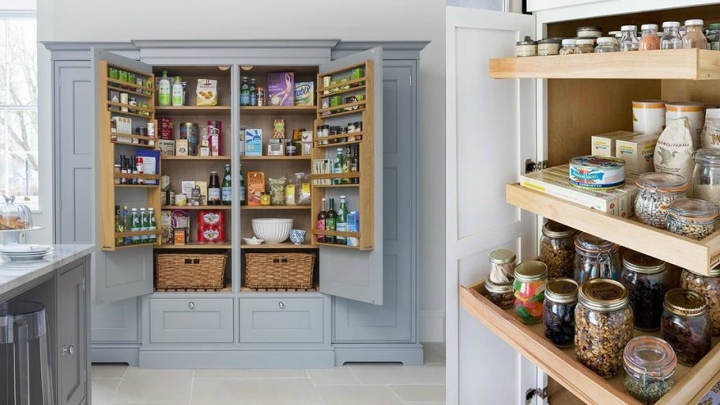 Here you can install a bar, a rail, a few hooks or small shelves to place the spices, for example, or hang some cutlery or rags. The long and narrow kitchens can be arranged in different ways. 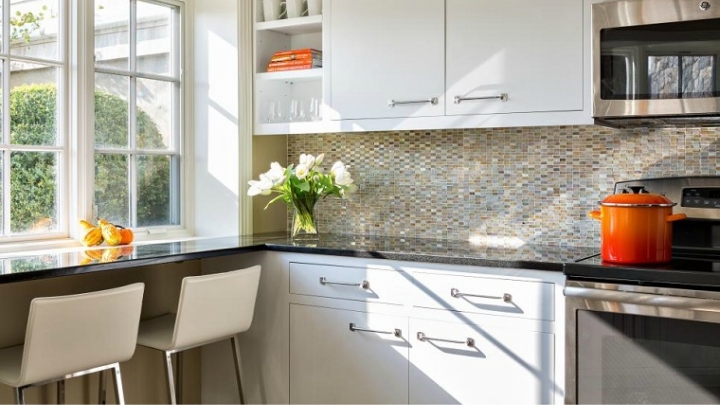 As we can see in the image on the left, a countertop has been placed on both sides and the front, so that the fire is on one side, the faucet on another and the rest of the countertop can be used to prepare the food. The natural light of the window will provide a very appropriate luminosity to visually enlarge the space. The tones are clear and the details of color give a very cheerful touch. 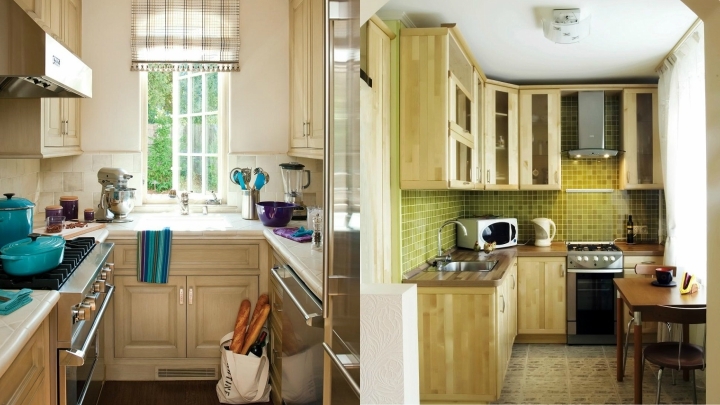 In the example to the right we see that the window area has been left to place a table, and in the rest we have opted for high and low cabinets, with an oven and a narrow cooker to take advantage of the available surface. There may be areas where it is not possible to install a cabinet but where there is enough space to hang some shelves. So that they do not occupy much place and saturate the space can be of background narrow, enough to be able to save some jars and small utensils like the juicer of juice or some book of recipes.